Sometimes you need to know the ID of a template, environment, VM, VPN, or Private Network Connection. Here’s how to find it. From the Dashboard or from the Templates tab of the Environments page, click the template for which you need the ID. The template ID is displayed in the browser address bar, after templates. For example, if the URL for the template is https://cloud.skytap.com/templates/123456, the template ID number is 123456. From the Dashboard or from the Environments tab of the Environments page, click the environment for which you need the ID. The environment ID is displayed in the browser address bar, after configurations/. For example, if the URL for the template is https://cloud.skytap.com/configurations/223344?sort=created_at&thumbnails=shown&env_details_meta_info=1&ga=1, the environment ID number is 223344. From the Dashboard or from the Templates tab of the Environments page, click the template that contains the VM for which you need the ID. In the template details page, click the VM for which you need the ID. The VM ID is displayed in the browser address bar, after vms. For example, if the URL for VM is https://cloud.skytap.com/vms/818818, the VM ID number is 818818. From the Dashboard or from the Environments tab of the Environments page, click the environment that contains the VM for which you need the ID. In the environment details page, click (Settings) on the VM for which you need the ID. The VM ID is displayed in the browser address bar, after vm_id=. For example, if the URL for the VM is https://cloud.skytap.com/configurations/123456/edit?selection=vms&vm_id=7654321#network_adapters, the VM ID number is 7654321. From the Dashboard or from the Environments tab of the Environments page, click the environment that contains the VPN or Private Network Connection for which you need the ID. 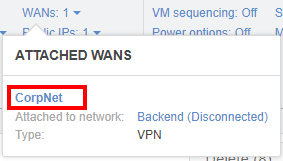 In the environment details page, under Networking Settings, click WANs to expand the list of attached VPNs and Private Network Connections. Click the name of the VPN or Private Network Connection for which you need the ID. The ID is displayed in the browser address bar, after vpns/. For example, if the URL for environment is https://cloud.skytap.com/vpns/vpn-443322, the ID number is vpn-443322. If the VPN or Private Network Connection name is not a clickable link, you are not an account administrator. Contact your account administrator to get the ID. See Finding your primary administrator.